Where is West Syndrome? Earlier this week while browsing through the contents of Lennox’s book, I wondered where his description of West Syndrome was hidden. Lennox is very careful in reviewing the historical data on epilepsy, but for some reason, he did not mention the report by William James West, who described a particular type of epilepsy in his own son that would later be named after him. Then, when I had almost forgotten that I was on the lookout for West Syndrome, I stumbled upon it in the chapter on myoclonic seizures. Myoclonic vs. myoclonus. Reading Lennox’s chapter on myoclonic seizures is a delight. One particular reason for this is the fact that he points out the difference between myoclonic and myoclonus from the very beginning, something that has confused me for quite some time as a student and young resident. Myoclonic refers to the single, shock-like twitch that is accompanied by a spike-wave discharge and does not affect cognition. Myoclonus, however, refers to a group of progressive disorders, a group of conditions that is now known as the progressive myoclonus epilepsies including Unverricht-Lundberg disease, Lafora disease and many other rare disorders. These conditions are progressive and eventually affect cognition. Myoclonus in these patients is semiconstant. Massive myoclonic jerks. Lennox mentions Infantile Spasms as a sort of myoclonic seizure as part of his petit mal triad, consisting of absence seizures, myoclonic seizures and atonic seizures. Infantile Spasms, Salaam seizures or massive myoclonias are described by Lennox in 1940 as events where “the infant suddenly flings his arms upward or outward as in the Moro or startle reflex, and simultaneously flexes his head and draws his legs upward to towards the abdomen”. These events occur in clusters, often distress the infant and might be mistaken as hiccups or colic. But untreated Infantile Spasms are actually an epileptological emergency that requires urgent treatment. Hypsarrhythmia. Lennox recognizes that the EEG in children with Infantile Spasms is highly abnormal. He uses the term hypsarrhythmia for this, which was first used by Gibbs and Gibbs in 1952. Lennox is under the impression that Infantile Spasms have many commonalities with absence seizures and myoclonic seizures and even suggests that many children with Infantile Spasms may go on to develop absence seizures. This, of course, is a hypothesis that has not held up to the test of time. Lennox also acknowledges that the neurodevelopmental outcome of many children with Infantile Spasms is poor. There is some ongoing debate whether Infantile Seizures might be called myoclonic seizures or tonic seizures. I actually had such a discussion with an Israeli child neurologist on Sunday about this. Therefore, reading Lennox’s stand on this afterwards made me smile. However, there is little evidence about any relationship between Infantile Spasms and absence seizures or myoclonic seizures. Why we came up with NLES. I was thinking about writing about NLES for quite some time, our EuroEPINOMICS acronym for non-lesion epileptic spasms. We came up with this acronym when we wanted to describe the group of patients that we collected as trios for exome sequencing. We initially suggested the term idiopathic West Syndrome, but this term is used by many epileptologists for a form of West Syndrome with good outcome. According to the current literature, this benign form of idiopathic West Syndrome may be present in up to 30% of children with West Syndrome. However, the patient cohort in larger centers is probably biased towards more refractory cases. I personally know only two patients with West Syndrome and good neurodevelopmental outcome plus one little girl I encountered during my last med school year. Most patients with Infantile Spasms have a more refractory course and spasms might not be limited to infancy (first year of life). In order to stay clear of any misunderstandings, we preferred using NLES as a group name to refer to this group of patients. By definition, this group also includes idiopathic West Syndrome, i.e. children who rapidly respond to treatment with little or no impact on the overall development. And, by the way, there is not a single positive gene finding in a child with idiopathic (!) West Syndrome. During my doctoral thesis, one of my supervisors told me that it’s always good to move southwards in your life. I went as far as Melbourne, Australia, where I got acquainted with epilepsy genetics and met my wife Katie. 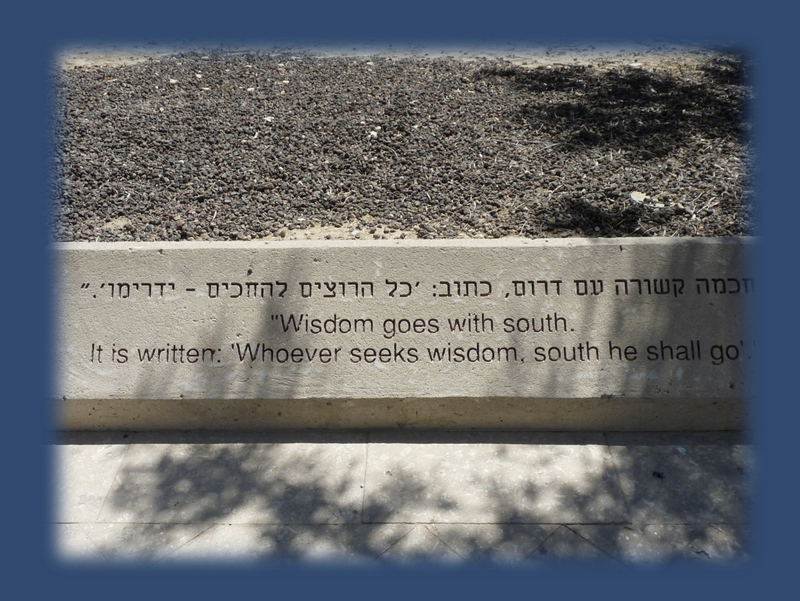 Until earlier this year, I wasn’t aware that this is actually a quote by David Ben Gurion (picture taken at Ben Gurion’s Desert Home in Sde Boker). The 34th meridian. When I sat down to write this post, I wanted to write about myoclonic jerks. However, reading Lennox has led me to Infantile Spasms and I have spent much of this post writing about this as I don’t agree with his view on what spasms actually are. To his credit, Lennox is quite modern when he assumed that spasms may come from the brainstem, a theory that is corroborated by modern imaging studies. The 34th meridian found its way into the title of this post since this is where I am located at the moment (Ben Gurion University, Be’er Sheva, Israel). I will be back on my way to Kiel tomorrow. This entry was posted in 2012, Epileptic encephalopathy, EuroEPINOMICS, Opinion and tagged Be'er Sheva, Ben Gurion, Infantile Spasms, Lafora disease, myoclonic epilepsy, progressive myoclonus epilepsy, Sde Boker, Unverricht-Lundborg disease, West Syndrome. Bookmark the permalink.